Finding the right candidates has always been and will continue to be a top challenge for recruiters and their clients. And, with the job market as strong as it is now, often times active and passive candidates for employment are relying on the available new media channels and not spending as much time as they should on dusting off an old resume or perhaps creating a new one. Let’s face it, the traditional resume or CV, will likely go away in the not too distant future. However today, how a candidate formats his or her resume is often the primary reason why a technology platform, a recruiter, or talent acquisition team will select and follow up with a potential candidate. 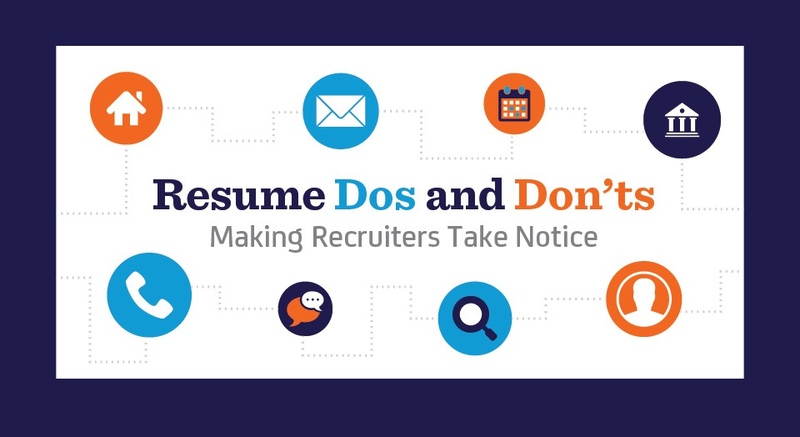 The below Resume Do’s and Don’ts infographic includes some great tips to help your employees, customers, and your team to be successful.